Allan Friis made his debut at the age of 19. Friis was early influenced by the Imaginism as weil as the Danish Dutch Cobra group, particularly Henning Pedersen and Svend-Wiig Hansen. The imaginative world with hybrid shapes of animals, plants and human beings was characteristic of Friis' works almost during a decade. He showed his paintings at different galleries, among other things, in Stockholm and Malme. A change in Friis' imagery took place in 1964. He now found his earlier imagery insufficient to describe the human beings' existential conditions and its alienated relationship to the fast economic technological development. The human beings' relation to the technology, its smallness and exposure on being confronted with an, obviously, fated cybernetic existence, is described as a science-fiction-like architectonic and technical world, often with a surrealistic suggestion. Works from this period are represented at several museums and public collections in Sweden. The tendency to describe our time, which was seen during the 1960's, gradually became more powerful and the paintings got a sharper social orientated and critical imagery, mentioning important social and existential questions. These pictures are parts of two main themes; "We are in the same boat", amongst others, shown at the national art galleries in Gothenburg (1973) and in Lund (1974), and "People in a suburb", showed, amongst others, at national art galleries in Malme, Eskilstuna and Alingses (1977). During the 1980's Friis started to work with a series ambiguous and tense landscape pictures, so called "Semiotic Landscapes" (pen drawings) and also a large number of "Existential" illustrations. Furthermore, Friis is proceeding with his social commentating pictures (in different techniques), among others "Social Studies" (lino-cuts, large size, 110 x 150 cm, about 43 x 59 inches), "Consequences" (1993-95, lino-cuts and oil on canvas, size about 105 x 135 cm, about 40 x 54 inches), "Side-Effects" (1994-95) and "Romantic Landscapes" (1993-95, oil on canvas, small sizes). 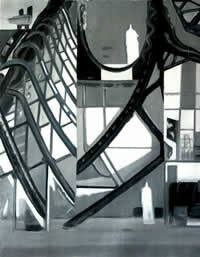 Friis' latest project, "Contemporary Descriptions" (oil on canvas), started in 2004. He is still working with this project. Allan Friis published two books in 2004. "The Kings Diary", with surrealistic diary pictures and with his own interpretations to every picture. The other book, "Medea the Terrorist" is a story about a revolutionary situation located in the Ã-resund Region. The story takes place in 2040. Separate Art Appendix enclosed in both books.